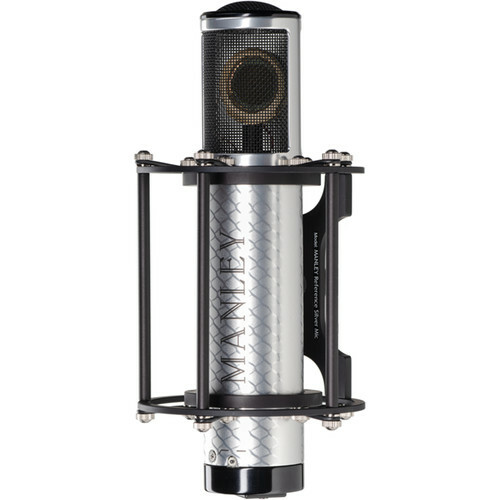 The Reference Silver Tube Microphone from Manley is a large diaphragm condenser offering a wide frequency response and accurate transient performance without coloration or any perceivable sonic signature. The rich tonal balance and classic, smooth character makes this switchable cardioid and omnidirectional mic very versatile and an excellent choice for recording guitars, pianos, drums, brass, and especially vocals. The Reference Silver Tube Mic features a 1" evaporated gold diaphragm that is 5 microns thick and can withstand sound pressure levels up to 150 dB. The open-weave stainless-steel grille allows the capsule to capture signals with zero-loss acoustical transmission, which translates to less dampening of high-frequency content. Inside the mic, the fragile high-impedance signal from the capsule first hits an FET sitting underneath the 5670 vacuum tube's cathode, which then amplifies the signal into a more robust voltage that a hand-wound Manley IRON microphone output transformer sends out to your microphone preamplifier. Sonic character is on the rich and warm side and is stunning with female vocals and saxophones with a round character that is never sibilant or boxy. The power supply is designed for vacuum tubes to deliver audio fidelity. All lines are regulated, all rails come out at super-low impedance, and there is a zero 50/60 Hz ripple component present in the chassis as the module runs at a much higher frequency, well above the audible range (10 Hz to 30 kHz, AMP to 60 kHz). Other features include: a precision suspension system mounted onto a rubber shockmount, a genuine leather capsule cover, and a rugged carrying case. The microphone is hand assembled in the USA.